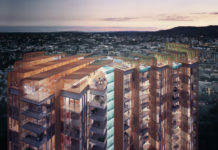 The largest single development application in Queensland’s history, consisting of tens of thousands of pages has been submitted by Destination Brisbane Consortium for the Queen’s Wharf Brisbane Integrated Resort Development (QWBIRD). The information contained in the development application has been provided by Urbis on behalf of Destination Brisbane Consortium as part of the detailed documentation development assessment process and provides a look into some of Queen’s Wharf’s many sub-precincts. The sheer size of the IRD (Integrated Resort Development) is mind boggling, and will change the CBD landscape forever. Per year, the precinct is anticipated to generate 1.39 million additional people visiting the CBD. Permanent and temporary population of the CBD will increase substantially after the completion of Queen’s Wharf. Permanent residential apartments of the IRD alone will increase the CBD’s population by around 35% from 10,336 persons (2016 census) with the addition of 3,600 new city dwellers across 2,000 planned apartments. Temporary population to the IRD will also increase with the IRD capable of accomodating 2,400 people across the five new hotels at 100% occupancy. Additionally, forecast employment will be boosted by around 10,118 per day. At 100% occupancy, the IRD would add an additional 56,118 people in a single day to Brisbane’s CBD, whether they are living, visiting or working in the precinct. This is more people then the maximum capacity of Suncorp Stadium (52,500). This large covered area is a multi-functional access space and provides the major vehicular entry to the IRD. The landscape intent is to provide a dynamic space that provides pedestrian connections to key parts of the IRD as well as vehicle access to the basement car park and dropoff / valet areas. Public access is maintained along William Street. Hover over black markers to view more information. The River View Terrace is proposed to be located on podium. It is a publicly accessible space which provides direct links to and from South Bank via a new pedestrian bridge. The landscape intent is to incorporate food and beverage zones as well as retail areas while framing the entrance to the IRD and maintaining a wide accessible pathway towards lifts, stairs and elevators for direct public access to George Street, William Street and other levels of the IRD. The Recreational Deck contains both publicly accessible and semi-private passive recreation areas. The landscape intent is to combine various recreational uses set in a lush subtropical landscape. The Sky Deck is a publicly accessible and semi private deck in certain areas. The landscape intent is to frame the various commercial uses while embracing the magnificent views of Brisbane City and beyond. The IRD heritage sub-precinct contains The Printery Building, Public Service Club / Courtyard, Stephens Lane, the former DPI Building the Commissariat Store / Forecourt and The Mansions. These form the most significant sub-precinct of heritage buildings in Queensland and are the most defining feature of the public realm. They frame most of the key spaces within the Queen’s Wharf Brisbane development. Stephens Lane is a publicly accessible laneway connecting George Street to William Street. The landscape intent is to maintain and enhance the existing connection while retaining its possible use for outdoor food and beverage related activities. Ramps should be avoided where possible in favour of steps and a lift to and from Stephens Lane; and Shaded seating areas. The landscape intent is to activate the external spaces around the former DPI Building, providing outdoor dining opportunities associated with the adaptive reuse of the building for food and beverage. Access will be provided to the lower ground level, and the mid level from Queen’s Wharf Plaza, the IRD and the Brisbane Steps. Viewing opportunities from the outdoor terraces to events and functions held within Queen’s Wharf Plaza. The landscape intent for the Commissariat Store Forecourt is to provide opportunities to use the courtyard for outdoor events. Provision for space to be used for functions / events. The intent around The Mansions is to provide opportunities to use the intimate courtyards for outdoor dining or retail space. Access will be provided around the building. Clear sight lines to be provided where possible and lighting improved for optimal CPTED outcomes in the rear laneway. Miller Park is an important open space linkage along the William Street “escarpment” leading down to the river. It’s steep slopes are largely unusable other than for planting. Terracing can help activate this forgotten park by increasing opportunities for use by a broad section of the public. Miller Park will remain as a public park. The landscape intent is to maintain and enhance its existing terraced and planted character by retaining its heritage walls and potential underground archaeological artefacts while improving access to it and through it for the public. The former Treasury Building is the entry to the Queen’s Wharf Brisbane development from the Queen Street Mall. It is surrounded by a limited however important public realm. The Treasury forecourt will remain as a public plaza. The landscape intent is to mark the entrance to the Queen’s Wharf Brisbane development and start the journey of the ‘Ribbon’. It will act as a beacon to draw people in from Reddacliff Place and continue the retail experience from Queen Street Mall into the former Treasury Building and the lower retail area. The former Treasury Casino will be relocated and the Treasury building is proposed to be repurposed to accommodate a range of centre activities, with particular emphasis on retail. Where possible integrate subtropical understorey planting on the forecourt and in the verges of William Street and Elizabeth Street. Queen’s Gardens provides a valuable void space in the city that allows views to some of the most impressive heritage facades in Brisbane. This void and the views will be maintained. Queen’s Gardens will remain as a public park. The landscape intent is to provide a high functioning urban space which has an ability to support multiple functions. The park allows the transition between the ground plane and the lower ground retail area while improving the access through it. The proposed minimum turf area for Queen’s Garden is to be less than what is currently existing, however all existing turf areas are sloping and thus have a limited functionality. The current slope generates operational issues and additional event set-up costs due to significant leveling required for stages. All the proposed turf areas will be flat and therefore able to accommodate a wide range of activities. The loss of turf in Queen’s Gardens will be further offset by the many other additional plazas and green spaces provided within the QWB development capable of hosting large city events such as Queen’s Wharf Plaza. Retail activity is proposed under Queen’s Gardens. This will help serve as an attraction to the area and activate the space. For it to be viable it must be visible from the surrounding streets and thus a suitably large opening is required through the surface of Queen’s Gardens to allow visual and physical access. Open sight lines to be maintained and lighting improved for optimal CPTED outcomes. The North Quay is an important entry to the Queen’s Wharf Brisbane development site. It welcomes visitors from multiple destinations and modes of transport. The Undercurrent Village reclaims an underutilised area of the Brisbane CBD riveredge as an vibrant waterfront entertainment precinct, connecting visitors to the river and reflecting the history and culture of the place. Brisbane’s first road, Queens Wharf Road, under appreciated and under utilised for so long, will become a vibrant entry to Queen’s Wharf Brisbane. Former State Library ground level café – providing streetscape activation along the length of Queen’s Wharf Road North. Queens Wharf Plaza will be the public realm heart of the Queen’s Wharf Brisbane development. It will be an vibrant public space that creates a setting for some of Brisbane’s most significant heritage buildings, as well as a hub for entertainment and community life. As the location of the original Queen’s Wharf that gives its name to the development, the Cove presents an opportunity to connect visitors with two of the most engaging features of the Queen’s Wharf Brisbane development – the River edge and the unique history of the place as ‘The Birthplace of Brisbane’. Queen’s Wharf Plaza will be a fully programmable primary public plaza that will be the heart of the Queen’s Wharf Brisbane development. It will provide multiple opportunities for events and pedestrian circulation to the River, increasing the “porosity” of the link while negotiating the large level difference between the river and William Street. The limitation of vehicular traffic on Queens Wharf Road North will dramatically improve the accessibility and legibility to this plaza from Queen Street to the River. The Landing represents an opportunity for Brisbane to see the ‘life on the other side of the REX’ (Riverside Expressway). It allows visitors to engage with the river and view the river as a central stage for activation and landmark events. The Landing is a key event space proposed to integrate the IRD, the city and the river. Located directly in front of the core development, it extends out into the river beyond the REX. A new foreshore with high quality open space will be provided. Opportunities for water access e.g. river beach – for access by canoes and other non-motorized craft. Waterline Park provides valuable recreational and open space that breaches the barrier created by the REX to connect the CBD with the rivers edge. Waterline Park functions as a key recreation hub between 1 William Street and the new foreshore. The park is also a key node for pedestrian and cyclist movement along The Undercurrent, with the William Street pedestrian walkway and bikeway, the Mangrove Walk and the Bicentennial Bikeway all converging in the park. Sited at the convergence of the Bicentennial Bikeway and Mangrove Walk, Waterline Park is embedded within the city’s pedestrian and cyclist network. The Mangrove Walk allows visitors to engage with the river buffered from the REX and focusing on the special natural qualities of the place. The Bicentennial Bikeway is key active transport artery within the Brisbane CBD. Everyday it serves a large number of recreational and commuter cyclists. Diversity and variation in river edge typology is offered through a dedicated pedestrian walkway proposed through the mangroves. This exploratory trail offers educational and interpretive signage, exploiting the natural richness and unique qualities of the Brisbane River. Clear delineation of cyclist and pedestrian movement will continue through the proposed Goodwill Bridge extension area where cyclists are land based and pedestrians are offered the more passive scenic route on the waters edge. A pedestrian bridge is to be constructed, extending from a landing point within the IRD to a landing point outside the Queen’s Wharf Brisbane PDA (Priority Development Area) at South Bank. This new bridge will be for pedestrians only and provide a direct pedestrian connection between the City and South Bank. It will also connect the IRD to the parklands, linking the two major tourist destinations in Brisbane and enhancing pedestrian access to South Brisbane rail station and beyond. The pedestrian bridge will enable a unified recreation, riverfront and entertainment destination for Brisbane. The bridge provides the opportunity for increased permeability and accessibility for the public across the river, and will further tie together the CBD and Brisbane’s main cultural attractions, including the Queensland Performing Arts Centre, South Bank Parklands and the Brisbane Convention and Exhibition Centre. The new pedestrian connection to South Bank and South Brisbane will provide an alternative route to Victoria Bridge and to the train and busway stations and in doing so, ease congestion at the pedestrian crossing points at the conflux of North Quay, Queen Street, William Street and Queens Wharf Road. The design of the bridge is currently at a conceptual stage with further detailed design to be undertaken. 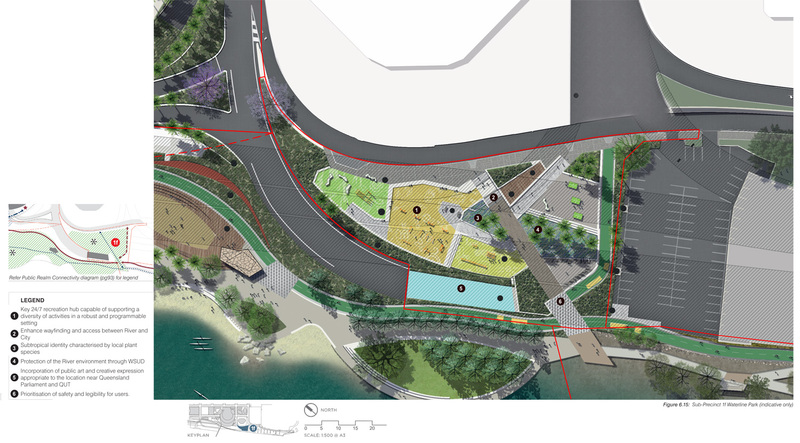 The proposed alignment is to a landing point at the Cultural Forecourt adjacent to the Wheel of Brisbane.  This alignment would, in effect, enable the bridge to connect the city grid on the Mary Street alignment to the West End grid on the Russell Street alignment. The preliminary concepts for the bridge indicate a deck consisting of a minimum of 4.5m meters wide pedestrian zone (between handrails) with a continuous slope of 1 in 20 ramps with landings that allow pedestrians to connect between the Queen’s Wharf Brisbane Integrated Resort Development (QWBIRD) and South Bank. The bridge will provide an observation platform over the river, and the North end landing is aligned with the River View Terrace at the heart of the QWBIRD. 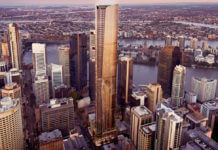 The design response is proposed as a dramatic, slender, arch-like structure that will be a vertical beacon along the river’s edge and provide lasting symbol of this new phase of urban renewal for Brisbane. The design requirements included in the PoD also seek a superior design outcome and a bridge element that will be a dramatic structural form and a ‘spectacular’ addition to the skyline. The DA number for this development is 846.
forwarded to me by Andrea at Positive RealEstate as an example of the exciting stuff happening in Brisbane. I would like to see some entire shaded walkways so that it’s possible to walk bigger distances while being shaded from the brutal Qld sun. Particularly the pedestrian bridge. It would also be nice to have one bridge that cyclists are prohibited – some of them don’t share the space very well.